This is the last in a three part series, how to paint lilacs and tulips in a terra cotta pot. 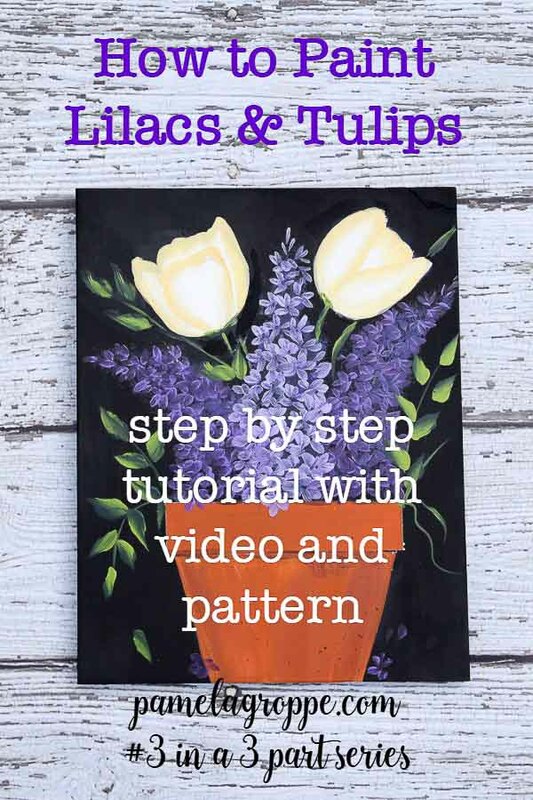 I show you how to paint both the lilacs and tulips in the video. How to paint lilacs and tulips in a pot is the last in the series on painting florals in a terra cotta pot. But since it began with the terra cotta pot lesson I guess it really is a four part series. 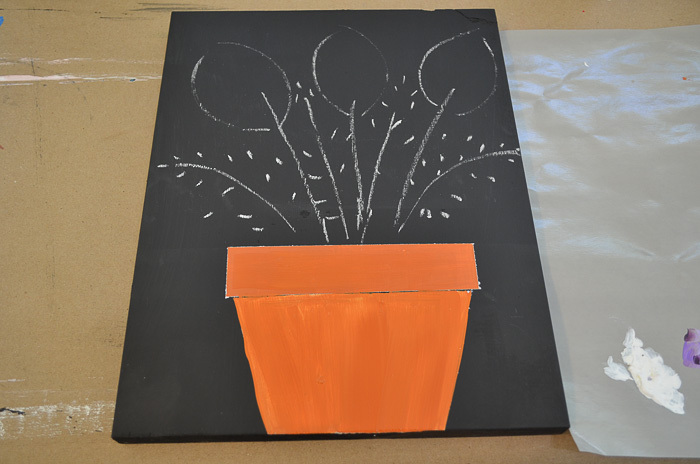 Go here for how to paint the Terra Cotta Pot. Keep in mind that you can paint whatever flowers you prefer, I just used these as an example so I could use the same colors. Using the same basic colors keeps it budget friendly for those just starting out but you get 3 different designs. I will share a link to the other lessons in this series at the end of this post. 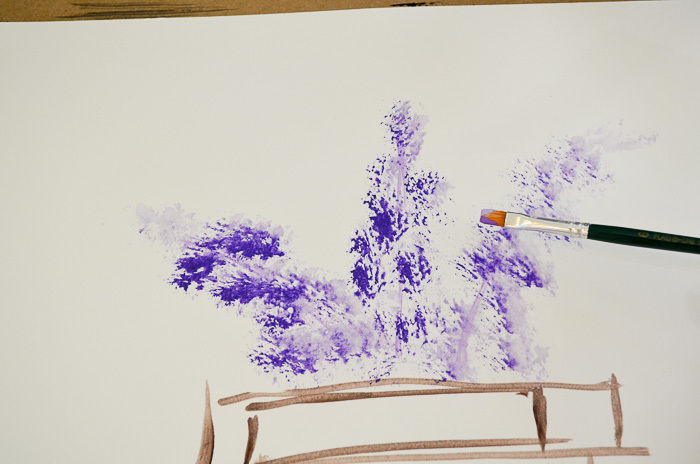 This post is how to paint the Lilacs. I have a couple videos available for tulips but I will create a photo step by step soon. At first, I fiddled around and chalked on a design. I thought 3 tulips was too many so I erased this and began again. The free pattern for this painting is available in my Subscribers Only Resource Library. For the lilacs I first loosely pounced in a background color. 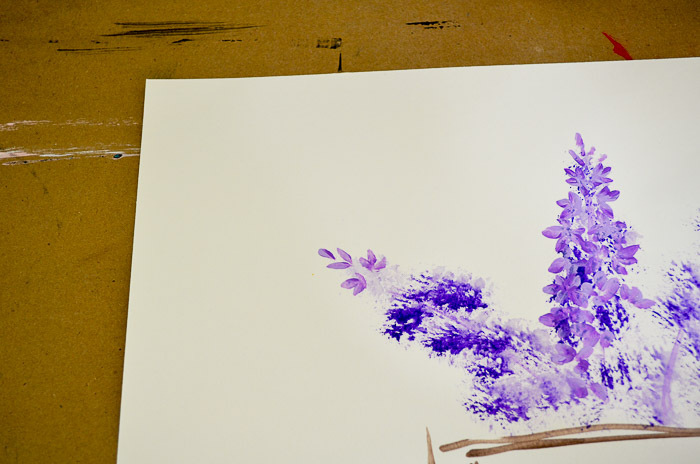 For the lilac petals I used a #6 flat brush. I double load with my two colors. 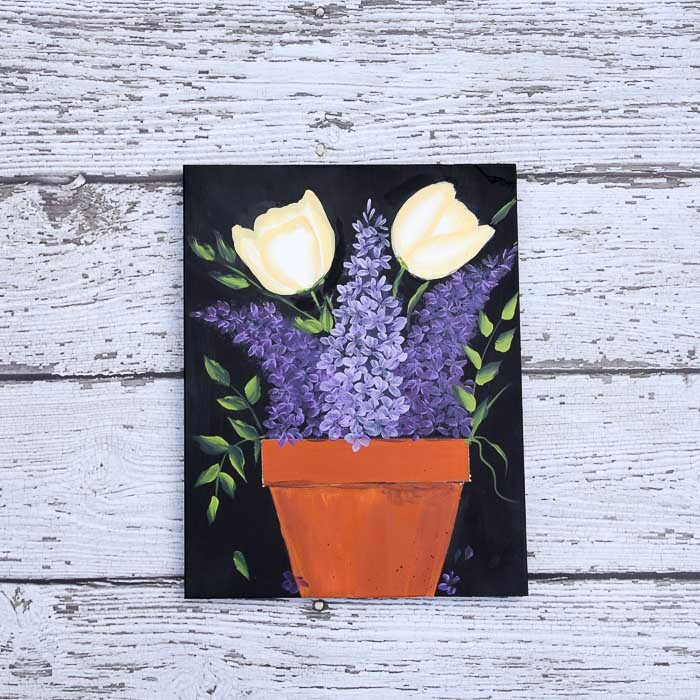 For the two outside lilacs I used Eggplant and Lavender Plaid FolkArt Multi-surface paint. The center lilac I used Lavender and Light Lavender. I start at the tip of the lilac and make a single chisel stroke. 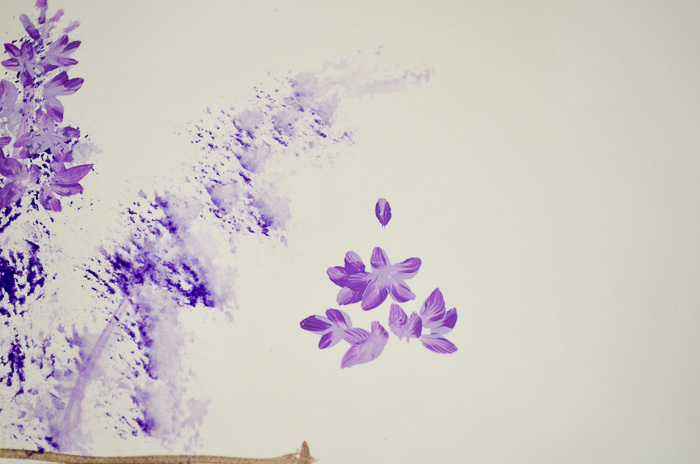 (for a tutorial on different strokes go HERE) Leading with lavender and trailing with the Eggplant. The trailing color is predominant when making these types of strokes. The strokes resembles an upside down tear drop. 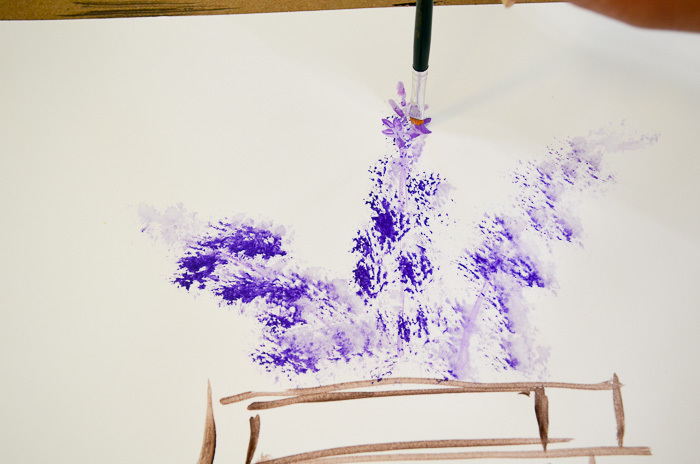 You make this stroke by pressing on the brush lightly as you pull towards a point, lifting as you go. In the video you can see it in action. For the top of the lilac I make individual petals and partial flowers. This makes the conical shape we are going for. I keep layering flowers and half flowers with a bud tossed in here and there. Work your way down until you have a lilac in bloom. Add leaves and trailing tendrils as you wish or follow the pattern I provide in my Resource Library. The pattern and supply list for this tutorial is available in my Subscribers Resource Library, you can join here. If you are already a subscriber then you have the password right in your email update. Stay tuned for my next series. You will love it, very summery. Thank you for letting me know, it gives me the encouragement to carry on!